Belated "Happy Independence Day" to all my friends. Wow, this is the 65th year after Indian independence. The country has come a long way since Aug of 1945 and we do have a long way to go. Actually I didn't have any thought of posting anything on this day but yesterday evening my daughter was playing with some colour clay. She had this orange and green clay in her hand ... hhhmmmm! I just gave her some white clay and asked her to keep her hands together as if to hold the three colours together. She was reluctant first but eventually she did:) I just grabbed my cam and clicked a few shots. Morning news was Anna Hazare's fast has been denied permission due to various reasons:( The police and the government had various reasons to this which might be logic but the underlying fact is that the reason for the fast might be a bit scary bit for the government. "BE PROUD TO BEAN INDIAN - JAI HIND"
BTW, I feel really government is bit scary and that is the reason it denied the permission. I dunno how long we are going to be mute spectators. But for sure, the day should come to join hand and fight against it seriously. Happy Independence Day! Very well said Reva. I am sure if everyone does their bit the world will be a better place. Lovely shot Reva. Loved your little one giving the salute too. So cute! That is so cute!! Happy Independence Day to you too!! Great post and very nicely written..Happy Independence day to you too..proud to be an Indian..bharat mata ki jai!! Jai Hind...Loved the pictures..
Belated wishes to u...great post really i am always proud to be an Indian ..Jai Hind !!! Wellsaid.If we make a few changes in the present it will be great helpful to nourish the future generation. 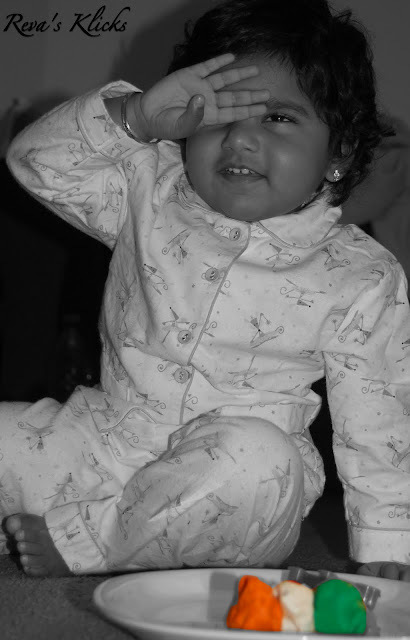 Your little one's salute is so cute..
awesome clicks dear......your daughter is very cute! Belated independence day to you too Revathi. Your daughter is so cute. Amazing clicks. That is a wonderful click, Reva! Love your clicks. Jai Hind. Happy Independence day Reva. Belated though. Your daughter is so so adorable.